the boldness and the confidence necessary for an actor to perform without being self conscious. Qualities which are underlined by the position of Tom's thumb. Check out a hand photo here. 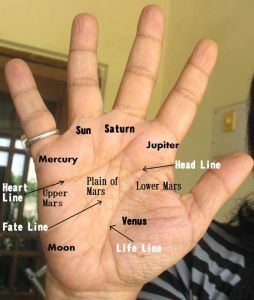 Other major signs on Tom's hand are his broad palm, fingers which are on the shorter side with square tips and the Mercury and Jupiter mounts fairly well developed. These and other signs tell us that this is a good guy! A person with a warm heart and a friendly nature, as well as a broad-minded and understanding attitude. The Headline and Jupiter mount tell us that Tom began his life in a very ambitious mode with a strong desire to accumulate wealth and fame, but as early as 30 his thoughts started to change and materialism started to take a back seat. Before he was forty, the materialism was almost gone. Such major changes in thinking in the span of a few years do not show emotional stability. Indeed, Tom can be moody and excitable. He is also the kind who needs emotional support. If one compares the mounts of his hand, Mars is relatively less developed. He could only be truly happy with someone who is available, and emotionally connected to him. Someone who is encouraging and supportive at all times because of an inherent weakness of character (Headline and Mars combined effect plus Moon mount). Nicole Kidman could not have made him happy as she would have been emotionally distant and not available to him at all times. When it comes to talent, Tom's Apollo finger, Headline and Moon Mount show creativity and skill. He certainly is talented, although not extremely so. It would be mainly his personality and charisma (and of course his looks) which have got him where he is. Talent, looks, plus an outgoing and friendly personality are a great combination. A lot has been said about Tom's affiliation to Scientology, but his hand does not show religious extremism. What his hands show is idealism, and a strong belief in something (Jupiter finger) but it does not show blind belief which is to my mind what extremism is all about. Perhaps because Tom is moody and tends to wear his heart on his sleeve, people misunderstand him. Besides, his warm and affectionate nature would predispose him to expose his vulnerable side. Sure, Tom has negative traits. There is a streak of stubbornness in his personality and he can be very controlling and manipulative when he wants something. This combined with his moodiness would not make him an easy man to live with. However, his good qualities could well overshadow these personality traits. If you want the same thing as Tom, he can be a very nice guy! Read about his ex-wife Nicole Kidman. Also about other internationally famous actors like Hugh Jackman's hand reading or Johnny Depp's hand analysis or Does Charlie Sheen have an addictive personality? Or Ben Affleck's Hand Reading or Ashton Kutcher or Denzel Washington and Julia Roberts. Or whether Mel Gibson and Russel Crowe angry people? Or check out hand readings of other Hollywood personalities. Needing emotional support is something that I did not expect. But I guess his personality is more on the positive side than negative. One question: Is it possible to judge someone by looking at their face/ mannerisms? Does that influence your hand reading at times? A lot of people ask me related questions like these, for example whether my personal view of the person affects the reading. I guess it is but human to be influenced, but if I have an opinion of the person whose hand I am reading the most it can influence me is to look for the signs proving that. If the signs are not there, I don't write it. For example I had a very good impression of Mahendra Singh Dhoni when I read his hand and looked desperately for some signs that he was a good strategist, but found none. I wrote many months ago that he was poor at strategy and it has been proved now! When it comes to Tom Cruise I had an impression that he was a religious extremist, a cult follower. But his hand has proved otherwise. I had no idea whether he was a good person or not, all I felt was that he was crazy! That is what the western media had portrayed, but it is far from the truth. I guess he is a fading star now. Palm print of Tom cruise indicating the fine theory of brain line with a fine gradual drooping with a dramatic gap between headline and lifeline.The brain line as a deviation between imaginary and materialistic plane opt for a dreamy affectionate disposition suitable as a scientist actor by his date of birth June3.With a small spatulate bottom shows creative intelligence.Fate line is hardly visible.But he will never be satisfied with his achievement ,aways craving for something just beyond.He will be generous in money matters inclined to deplete your resources by giving to benevolent institutions and helping his relatives.and those his by marriage.Mentally extremely versatile. Thank you for your analysis Sankaravelaudhan although I am unsure as to how you reached it. Does Charlie Sheen have an addictive personality?